Clearsand will cater to all types of parties from small house party to large corporate gatherings. You can expect the up most professional service and courtesies. We pride ourselves in the fact that all of our current corporate clients have used us on more than one occasion. Many such as the Canadian Mental Health Association, Worley/Parsons Komex, AJM Petroluem Consultants are all repeat clients of Clearsand. Sound System: The sound system will be tailored to each location and venue. The cost of supplying such a system is a variable so Clearsand will provide you with a written quote every time for every new venue. We supply all required mikes, stands and even cordless equipment for more elaborate settings. The Sound system can be used for the evenings entertainment as well as dinner or lounge music. Light Show: Clearsand has an impressive 2000 Watt lighting system to create instant dance atmosphere. This light show allows the DJ to tailor both music and light for a terrific dance experience. Music: Clearsand is flexible in the types of music clients wish to hear. We supply dinner music of all kinds, as well as theme music, or holiday music depending on the occasion. The Music Database over 6200 song titles from every era and type of music. Clearsand plays an excellent variety of music and that is the opinion of our clients and not us. Remember we do not advertise, as word of mouth is our company’s greatest form of marketing. We have no problem taking requests or customizing the music for your particular event from Older Crowds to Elementary school dance. PA System: Your company function may have presentations or require micro phones for your own presenters or speakers. Clearsand will supply that as well and perform micro phone checks to insure a smooth evening for your MC. Non-Profit: Ask Clearsand about its support of non-profit organization functions. Clearsand is a responsible member of the community and is always willing to offer its services at cost for a good cause. Ultimately you should expect to have a great time, with lots of great music to dance too. Our clients keep asking us back for that exact reason. 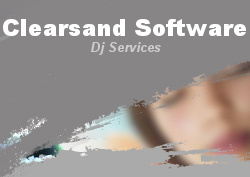 Products and Services provided by Clearsand Software Inc.